Learn from us! Get trained by the experts at RAKtherm Global Academy! Grab the opportunity to get yourself certified and trained by the leaders in the piping industry and give your career a jump start. 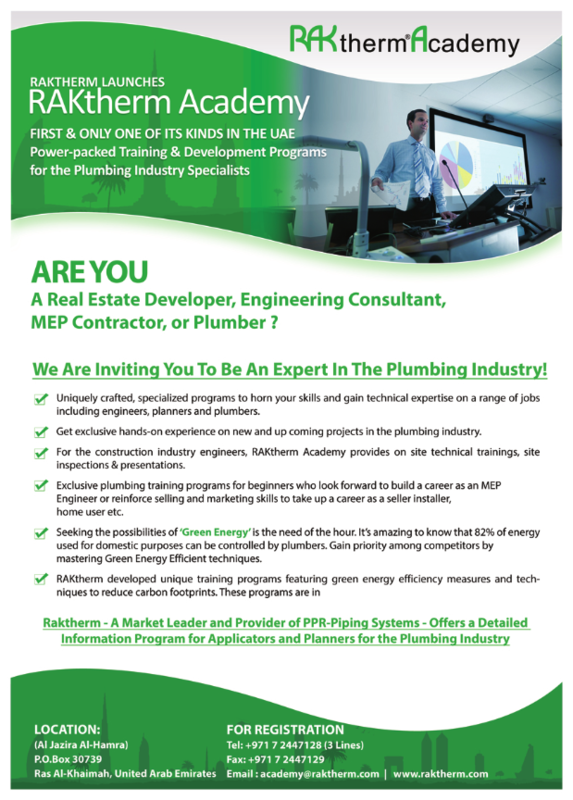 Establish yourself in the plumbing industry! Churn your skills to be your own boss and learn ways to set up your own business in the plumbing field! Our program is the foundation of plumbing knowledge expertise which provides trainings and skills in a more in-depth level. Why not get the training that can help you turn pro at RAKtherm? Advance you skills and qualifications in the plumbing and piping industry! We have specialized training programs where you will gain the skills to perform plumbing works and gain technical expertise on jobs including engineers, planners, and plumbers. Get exclusive hands-on-experience on new and up-coming projects in the plumbing industry. We provide on-site technical trainings, site inspections and presentations for construction industry engineers. Exclusive plumbing training programs for beginners seeking to establish a career as MEP engineer or to reinforce selling and marketing skills to take up a career as a seller, installer, home user, and others. Gain the advantage of learning the “Green Energy” of which 82% of energy used for domestic purposes can be controlled by plumbers by mastering the Green Energy Efficiency Techniques. Learn exclusively from RAKtherm Academy’s training programs the measures of promoting green energy efficiency and techniques on how to reduce carbon footprints that are in strict pattern of compliance with government regulations initiated by the government. Be an Expert and Register Now!